The brewing industry has gone through a cycle dating back to the pre-prohibition era. We are currently in one the largest craft beer revolutions and the innovators and brewers in the Motor City are at the for front. 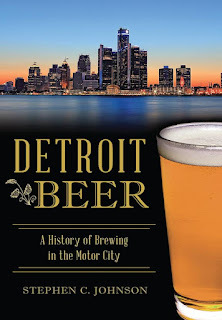 Experience the journey from pre-prohibition to present day through the eyes of a Michigan native in Arcadia Publishing and The History Press' latest in there American Palate series "Detroit Beer: A History of Brewing in the Motor City". "Detroit Beer: A History of Brewing in the Motor City" documents the rise and fall of the once great beer city of Detroit and the present day craft beer boom occurring in and around the Motor City. Stephen Johnson, owner and founder of Motor City Brew Tours, parlays his tour guide experience to create a book that will interest a history or beer enthusiast. Through operating a history and beer eccentric touring company for the past seven years, Stephen has gathered beer artifacts and stories from the Motor City's vast brewing history. Stephen brings history alive with his descriptions of such breweries as Stroh Brewery Company, Pfeiffer Brewing Company, and Goebel Brewing Company accompanied with present day photos. As you the book progresses you realize how incestuous the brewing industry became after prohibition and the passing of the 21st Amendment. The brewing industry is still recovering from prohibition and only recently surpassed the number of active breweries opened in the U.S. with 4,269, breaking a recorded held since 1873 according to the Brewers Association. Local brewing has returned with a bang in what Stephen describes as the three waves of the Craft Beer revolution. Detroit Beer finishes with a brewery index of Metro Detroit including brief descriptions of each brewing and their location, Metro Detroit is segmented using Woodward Ave as a dividing line. "Detroit Beer: A History of Brewing in the Motor City" is a great read for any Michigan history and/or beer enthusiast. "Detroit Beer: A History of the Motor City" is the newest addition to Arcadia Published and The History Press' American Palate series. You can find a copy of Detroit Beer through DetroitBeerBook.com, www.ArcadiaPublishing.com, and Amazon.com.